Goodreads says, "Marin Bishop has always played by the rules, and it's paid off: on the cusp of thirty she has a handsome fiancé, a prestigious Manhattan legal career, and her father's hard-won admiration. But with one careless mistake at work, Marin suddenly finds herself unemployed and alone. Before she can summon the courage to tell her parents, a young woman appears, claiming to be Marin's half-sister. Seeking answers, Marin agrees to join her on a soul-searching journey to Cape Cod, to meet the family she didn't even know she had. As the summer unfolds at her grandmother's beachside B&B, it becomes clear that her half-sister's existence is just the first in a series of truths that will shake Marin's beliefs--in love, and in her own identity--to the core. 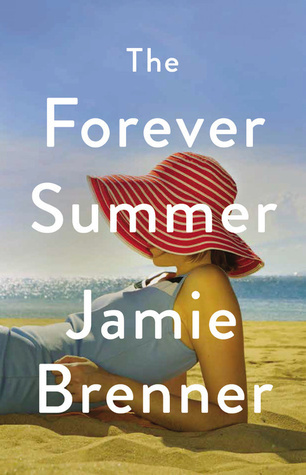 Filled with shocking revelations, heartfelt romance, and resilient women banding together against the most unexpected twists of fate, THE FOREVER SUMMER is an emotionally resonant page-turner, and a delicious escape for any season." Haha. I know, right? I am so ready for spring. Thanks for visiting, Christina! Totally you and yes, a perfect beach read! Haha. Yes, it is! I'm glad you agree. Thanks for visiting, Joy! Definitely says beach. I haven't read anything by this author, but I might check this one out. Great pick! She's a perfect author for a good vacation read. Thanks for visiting, Natalie!